GoKart could be a recommended things to do for you who need Bali Speed activity. It is offering fun sports and speed challenging drive during your holiday in Bali. 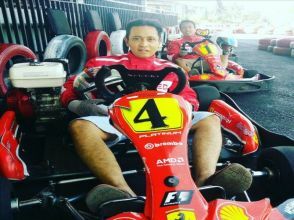 Located in Km 27 Jl Ida Bagus Mantra, just nearby with Keramas surfing beach, Aero Park Bali and Bali Safari and Marine Park, Bali Speed GoKart will give you race experience of timing system where you can see your name on their TV when your break time. So you will know how many speed for each lap that you can go. Once play GoKart you will have 7 mins on the circuit, for beginner GoKart drive usually can do about 9 laps around. Bali Speed GoKart just open o April 1st 2017, provide a good GoKart rental in Bali with theirs own new circuit and professional crew.